#LTFE: What’s my identity? Exploring the identity of a Learning Technologist through the analysis of a tweet. By Geraldine Murphy, Rachel Challen and David Hopkins. Based on David Hopkins previous blog posts about perceived identities of Learning Technologists, the #LTFE project was developed to explore this conundrum in Further Education. The outcomes of the #LTFE project were based on qualitative data that was collected through the capture and archiving of Twitter posts from October 2013-November 2013, using a tagging system on Google docs. 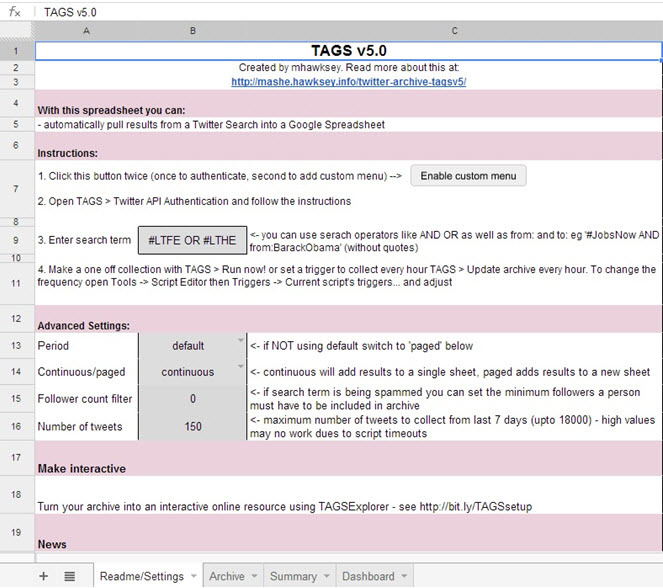 The TAG (Twitter Archiving Google Spreadsheet) system, developed by Martin Hawksey, allows the user to archive Twitter posts using specific search functions. There is also an inbuilt analytics spreadsheet page that allows you to see the top Tweeters, number of links, number of Re-Tweets, unique Tweets and average Tweets per person, which proved to be a valuable tool for the research variables in extracting and comparing report data. The data was gathered by performing automatic searches, set to specific requirements, of all Tweets containing the hash tag #LTFE; all non-case sensitive tweets were also included within the searches. The data was archived into a spreadsheet that generated #LTFE specific statistical data, including number of Re-Tweets and links, as well as user data containing information on Twitter user, time stamp, Re-Tweets and specific status URL’s. Due to the archiving of such personal data, this project had to adhere to the Data Protection Act of 1998, acknowledging that all of the data that the tag system would pull-in and store for this project would remain anonymous and confidential and stored in a password protected file. What makes this tool particularly fascinating relates directly to the nature of social media and its power to share information to large audiences in real-time. When social media is used to gather data in such an open way, researchers inevitably employ an accidental sampling strategy. Although sampling occurs ‘accidently’- participants are ‘selected’ or self-selected due to their appropriateness and suitability- not to mention their access to and participation in social media formats. The nature of social media creates a ‘snowball’ sampling effect as project links and hashtags are shared, or ‘retweeted’ between followers and it is this process that allows the chain to continue. Importantly, it is the use of this snowball sampling effect which is “essentially social because it both uses and activates existing social networks” (Noy 2007, p7) as a collection tool that held the potential to enable the small-scale project to access a larger sample and thus generate a higher volume of response. The full case study is currently under peer review for the ALT Journal under the title “#LTFE: What’s my identity? Exploring the identity of a Learning Technologist through the analysis of a tweet”.